Christmas is a lovely time of year, but it also surrounds us with holiday treats that are full of sugar and fat. Foods high in sugar are detrimental to our teeth and gums. Providing dental care in Newberg, Oregon, Dr. Jennifer McLeod reminds patients of all ages to try to avoid the following Christmas foods as much as possible. While popcorn in and of itself is not necessarily bad for teeth, covering it in sticky caramel turns it into Tooth Enemy #1. Caramel is essentially liquified sugar that hardens into a sticky goo. Food that sticks to teeth – most often in a sugary form – can lead to tooth decay. The bacteria that lives in our mouths feed off the sticky residue, producing acid that wears away tooth enamel. If at all possible, avoid sticky foods like caramel corn, or brush your teeth directly after consuming them to wash away the goo. Hard candy – like candy canes – last a long time, which is one of the reasons we like them so much. 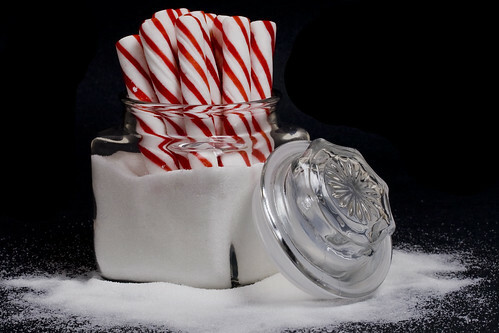 But sucking on a candy cane or similar hard candies essentially provides our teeth with a sugar bath. Naturally occurring bacteria rejoice, taking the opportunity to produce acid that causes cavities. It might sound non-intuitive, but replacing candy canes with a couple of bites of peppermint chocolate might be a better alternative for healthy teeth. Not only are we surrounded by sugary treats, but favorite Christmas beverages like hot buttered rum, hot cocoa, and eggnog can tempt us at every turn. It’s important to avoid these beverages that are high in sugar and fat, instead choosing alternatives. These can include sparkling water, iced tea, coffee, or milk to wash down a couple of Christmas cookies. Eat or drink Christmas foods and drinks with a balanced meal. This will help you control portions and sugar levels to help you feel more even and protect your teeth. Grab some sugar-free gum to chew, preventing overindulging and keeping your mouth busy. Limit the time of day that you eat or drink Christmas treats. This can help keep you from eating and drinking all day long, focusing your attention on really enjoying the treats when you have them. Brush your teeth during the day. Taking a break to brush your teeth in the middle of the day can keep them extra clean and bright. The practice can also help remind you to take a break from Christmas treats. Dr. Jennifer McLeod and her team at Newberg Family Dental wish all families a very happy holiday season. To receive gentle and compassionate dental treatment in Newberg, OR, call (503) 538-7717 for your appointment!